It's been awhile since I've blogged. Please excuse my silence due to my hectic work and family life at this point of time. I'm now working in the West Midlands while my family is still in Surrey. So I stay during weekdays up north then comeback down every weekend. It's stressful yes, that's why plans are afoot to move everybody up near where I'm working. I'm keen to move to a more permanent accommodation there so that our family life would be more stable and of course so I could keep on blogging about food! Come to think of it, it's a good thing my new work is in still in England otherwise this blog would have to be renamed the Scottish Patis or Irish Patis. LOL! Never mind my current crisis, I'd like you to see my brother-in-law's blog about my almost 2-year-old niece Mia and their lovable dog Baba. They are his inspiration for his excellent children book Baba the Bear. 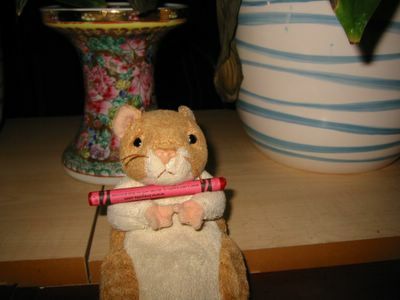 Do have a look at both the personal blog and the book's website and see the very cute illustrations that only a former Disney animator like him can come up with. It's not as marbled as I liked it to be but I think this will do for a marbling virgin. ;) My youngest's school was having their cake sale fund-raising day so she wanted me to bake at least one cake. Take note she said - I have to bake - no maybes, no requests, it's compulsary! Well, fortunately her mum is quite up to the challenge. One of the school's requirements was there should be no nuts in any of the cakes to take into consideration some of her nut-allergic schoolmates. I found this in the Cookies cookbook (the name of the author escapes me at the moment). Lovely texture and very nice luscious taste even with the walnuts omitted meaning it's a definite keeper of a recipe. Preheat oven to 180°C/fan 160°C/350°F/gas mark 4. Grease and line a 13 x 9 inch baking pan, grease the lining paper as well. Melt the dark chocolate and butter in a heatproof bowl set on a saucepan of simmering water (making sure that the bottom of the bowl does not touch the water). Once melted, mix to combine, remove from saucepan and cool slightly. Add the vanilla and stir to mix. Sift the flour, baking powder, and salt in a small bowl. Set aside. Beat the eggs with an electric mixer until light and fluffy (about 4-5 minutes). Then gradually add the caster sugar while beating until well combined and smooth. Gently fold in the flour mixture in batches using a metal spoon until well blended. Next, gently fold in the melted chocolate mixture and walnuts (if using). Set aside about 1 1/2 cups of this chocolate batter. Beat the cream cheese and butter together until well blended. Add in the caster sugar. Mix well. Beat in the eggs, vanilla, and flour. Mix well. Spread the chocolate batter in the prepared baking pan. Pour the plain batter on top. 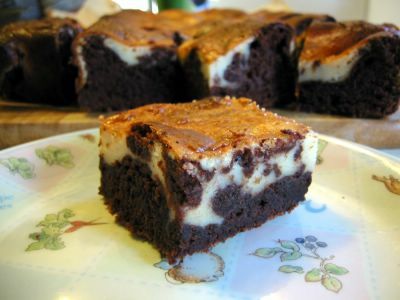 Drop spoonful mounds of the reserved chocolate batter on top of the plain batter. Using a metal skewer or butter knife, swirl mixtures to marble making sure not to blend completely. Bake for 35-40 minutes until just set. Cool for 5 minutes in pan then unmold and cool completely. Cut into squares or bars for serving. 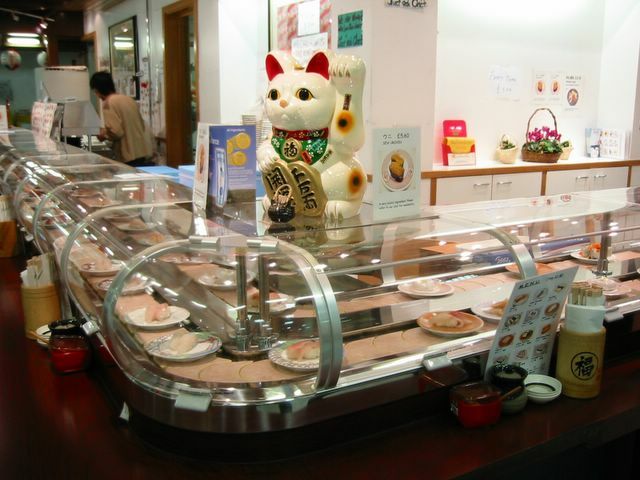 Maki's new food blogging event caught my eye the last time I visited the IMBB portal. 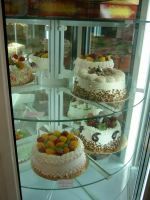 She asked us to blog about restaurants, shops, markets, or anything foodie or cooking related in our locale that we can recommend to visitors. Thank goodness she extended the deadline because I was caught up with work, moving and all that jazz and didn't have time to do a write up. I really don't want to blog about places in central London because as expected with popular tourist places, you just have to search in the internet to get reviews even to the most obscure hole-in-the-wall places. There are so many books and magazines with exhaustive listings of the best foodie places. So I thought of sharing with you a place a just a little bit outside in the north of central London that me and my family love to visit once in a while (because it's quite far from our place). Although I occasionally like fancy shmaltzy restaurants, you know the type where there are so many cutleries and glasses on the table you wouldn't know where to begin, I can confidently say that I am a more of a 'rough and ready' type of eater. Probably more bistro than haute cuisine. Besides the obvious savings in money, I like the informality and unpretentiousness of these simple no-nonsense eateries where the most essential thing - the food - is the core of the experience. Therefore, it's no wonder that I'm quite fond of Oriental City. 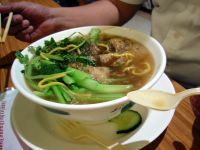 I first found it when 2 months after arriving here in UK from Hong Kong, we were missing our usual dose of hot satisfying Asian food. 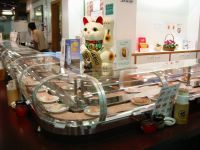 That time there was a dearth of authentic oriental restaurants in our area. In fact, there was none. All of the Chinese restos then were catering to the Western palate. You know, the sweet-and-sour-springroll-chow-mein type of food. 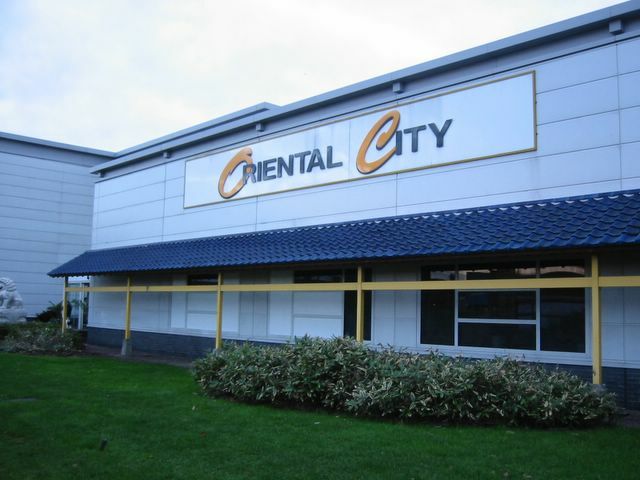 I trawled our yellow pages (internet then were at its infancy) and saw this Oriental mecca in north London. Yaohan Plaza was the name in its first incarnation, touting the phrase "All of Japan in One Roof". Then the Japanese parent company got broke so now the new owners named it Oriental City which I think is quite apt since under its roof it is a meld of all kinds of shops and restaurants from the Orient. 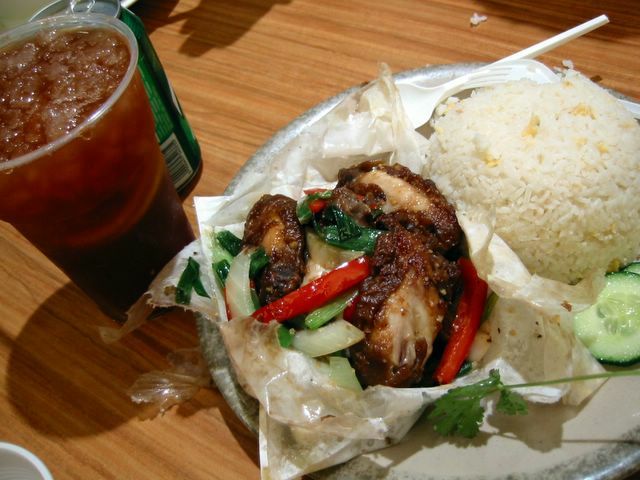 Just to give you a sampling of what we had last time ... [left] paper wrapped Thai chicken with rice and iced lemon tea; [right] Malaysian-style noodles which I am currently addicted to. 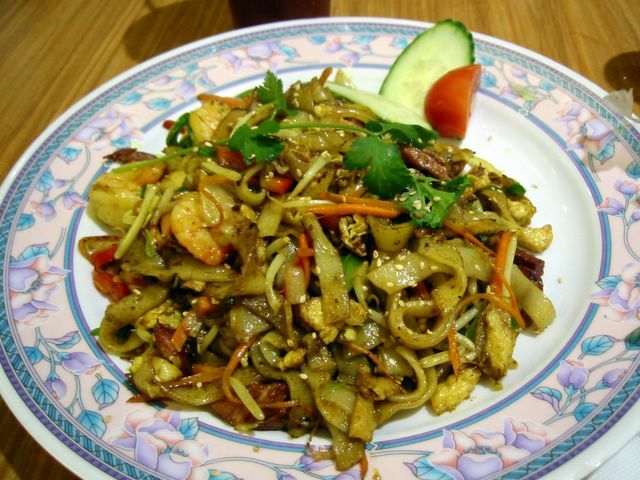 It's basically the same as the curry flavoured Singapore-style fried noodles but with flat rice noodles. [left] Noodle soup for my husband (I can't remember if it's Chinese or Japanese ramen); [right] They also got your favourite conveyor belt Japanese sushis. All these at very reasonable prices and often very good quality. The place also have cake shops and a Japanese bakery which made me almost jump for joy when I saw it since I've always been a fan of Japanese breads and cakes when I discovered it in Hong Kong. 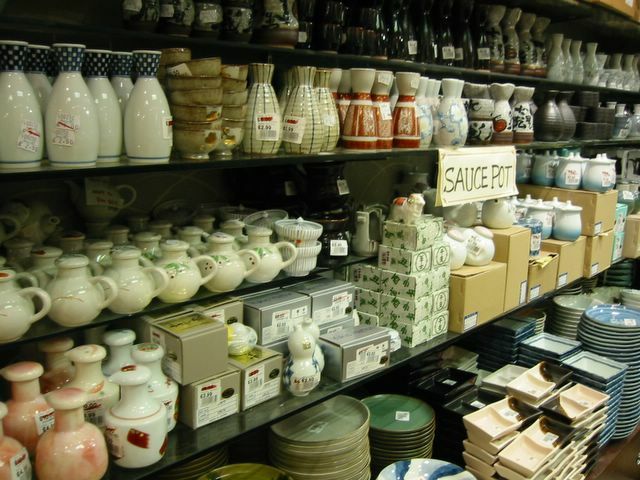 There are several shops that sells Japanese ceramics and other kitchen and bathroom knick-knacks, a jewelry shop, Japanese bookshop, video arcade, 2 other Chinese restaurants, 1 expensive Japanese restaurant, an aquarium and fish shop, and a central hall where events are regularly held. Update [01 Aug 2014]: This beloved centre closed its door for the last time on 1st June 2008. 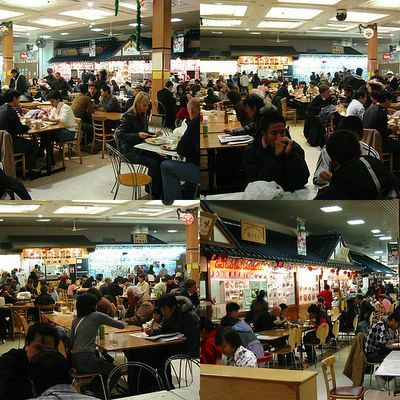 There are still no replacement food centre dedicated to Oriental cuisine in the London area as of this time. 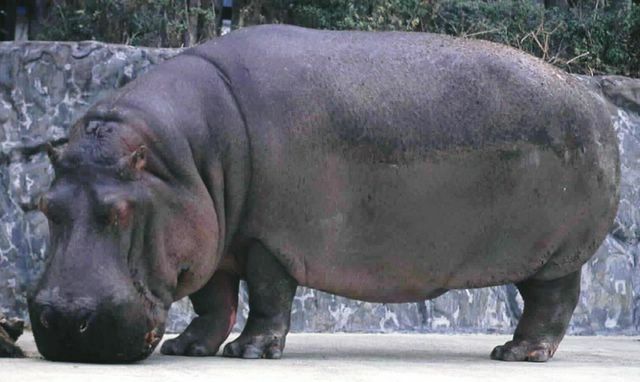 Whenever I see a hippo it always reminds me of paksiw na pata and vice versa. I wonder why? ;) Must be something to do with the folds of fatty skin and bulging roundness in its body. Pata is the Filipino name for pork legs. Come to think of it, the word is actually Spanish. Paksiw is one of the standard traditional Filipino way of cooking dishes almost at par with the ever popular adobo probably because of its simplicity and ease of preparation. 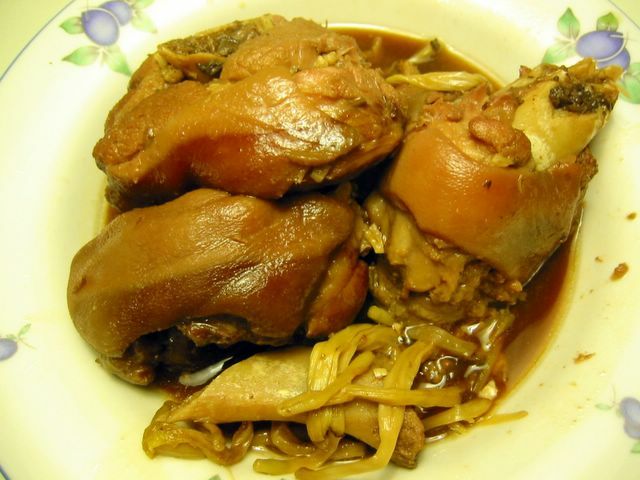 Certainly it's very similar to adobo except that the proportion of vinegar to soy sauce or salt is higher. It also uses dried banana blossoms. Now, I used to think that the ones we actually use is the dried lily buds same as the ones the Chinese use . But a check with a fellow food blogger, with my mother in the Phils, and on inspecting a packet from a Pinoy food store here, confirmed that we indeed use dried banana blossoms. It was not a fairly tale or a misnomer. Though you can definitely substitute the dried lily buds if it's not available - I can attest to that. Like most Filipino dishes, this is best eaten with piping hot steamed rice and for me a little side dip of patis. Yum! 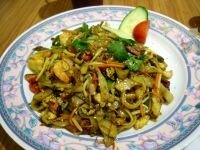 Combine all the ingredients except the brown sugar and dried banana blossoms in a pot. Bring to boil then lower heat and simmer for 1.5 hours or until pork legs are tender. Add more hot water if it is drying out too much. Stir in the brown sugar and banana blossoms and simmer for a further 5 minutes.